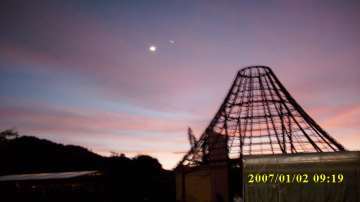 Photo by Yizhin drolma dated November 1, 2008 when we first spotted the first moon and a star rising in the sky, Khadiravana Center. The iron structure of the sala or pavilion confirms our commitment to the Bodhisattva path. Vasutara has a beautiful meaning of the Tara of the Earth. We expect the roofing and skylight of the pavilion to be completed this weekend.